The newly restyled 2015 Nissan GT-R sports car is feature-packed with a variety of innovative and intelligent amenities and conveniences designed to compliment its powerful high-performance engines. Offering three distinct models to choose from, including the all-new NISMO, Premium, and Black Edition, shoppers looking for a new 2015 Nissan GT-R in Peoria will enjoy the great collection of new technologies intended to satisfy any performance sports car enthusiast. The brand-new GT-R provides outstanding control, unbridled horsepower and unmatched style, which you can read more about as our 2015 Nissan GT-R review continues below. Boasting over 600 horsepower and 480 pound-feet of torque, the 2015 Nissan GT-R NISMO is the fastest Nissan GT-R ever built, surpassing the Black and Premium GT-R models with its high-capacity 3.8-Liter, twin-turbocharged V6 engine. Backed by a six-speed dual clutch transmission and featuring a new aerodynamic carbon-fiber body, this lightweight powerhouse is a testament to power and speed. The included NISMO-tuned suspension is ideal for tight twisting turns at speedway speed. With excellent aerodynamics and handling, the GT-R is truly a supercar driver's dream. The Premium and Black Edition GT-Rs may not match the 600 horsepower production of the NISMO, but they are not to be dismissed. With a 3.8L V6 engine outputting 545 horsepower and 463 lb.-ft. of torque standard, no matter which 2015 Nissan GT-R you choose, you're getting a top-end racer. With the addition of the standard 20" wheels with high-performance run-flat tires and the revolutionary Nissan/Brembo Braking system, the 2015 Nissan GT-R in Peoria is the top of the line in precision Nissan racecar construction. Packed with technological advancements, including a Bose Active Noise-cancellation system, high-intensity LED headlights and optional premium interior packages, the new 2015 GT-R is designed to be as comfortable as it is powerful. Many of these features are being offered on the GT-R NISMO as well, enhancing your driving experiencing with every touch of the accelerator. Continue reading our 2015 Nissan GT-R review below for additional information and availability, or watch a detailed video below for a more in-depth look inside and under the hood. 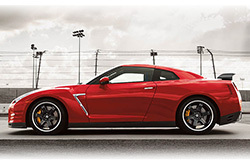 Or, stop in to test drive your own 2015 Nissan GT-R at Peoria Nissan today! When you compare Nissan's new 2015 GT-R head-to-head with the 2015 BMW M6, Porsche 911 Carrera, Chevrolet Corvette Z06 and the Audi RS 5, we're sure you'll determine that the GT-R is perfect for you. 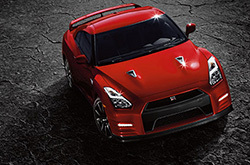 AZ shoppers will be pleased with the GT-R's leading-edge features and cut-rate sticker price. Compare its price against the vehicle options listed above and you'll undoubtedly see that it's a truly outstanding value, which makes it a top choice for many Phoenix Nissan customers. For more details about what it offers, check out the GT-R's quick-facts list under this paragraph. 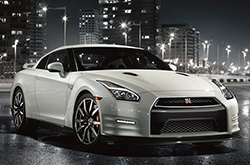 Thanks for choosing Peoria Nissan as your resource for 2015 Nissan GT-R reviews and comparisons. Not all car franchises in Phoenix are the same. We feel it's our job to supply customers with quality vehicle reviews; this sets us apart from the typical franchise. Each paragraph is brimming with accessible data, including info about safety technologies and more - everything you need to make an sound purchasing decision. Not sure if the GT-R? is made for you? Check out our online research index to read more Nissan reviews and to compare Peoria Nissan's models to vehicles from other brands.